Photos courtesy/copyright Pete Boden/Shoot 2 Thrill Pix. At the 2017 Space Coast Super Boat Grand Prix in Cocoa Beach, Fl, throttleman John Tomlinson and driver Myrick Coil’s 38-foot Skater Powerboats catamaran dominated the Superboat class, kicking off the offshore racing season opener with a win! With six boats in the Superboat class, the defending 2016 national and world champion Performance Boat Center/Jimmy John’s team of throttleman John Tomlinson and driver Myrick Coil had its work cut out in its 38-foot Skater Powerboats catamaran powered by twin Sterling Performance engines. But Tomlinson and Coil picked up right where they off last year and claimed first place for the second year in a row at the venue. No Cocoa Beach event is complete without at least one north buoy impalement. Two years ago, that honor went to Billy Glueck and Brett Furshman in the Superboat Extreme-class Twisted Metal Fountain V-bottom. 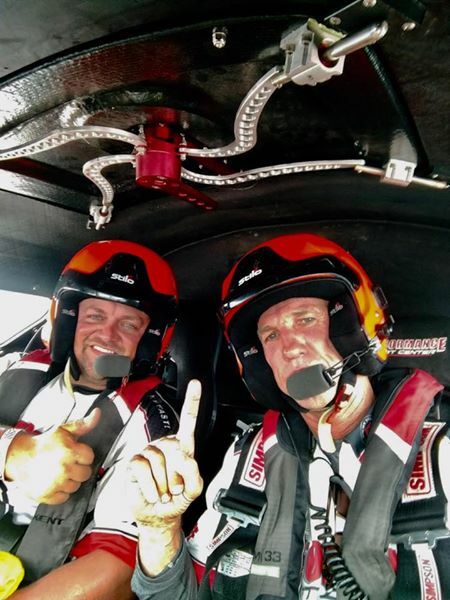 This time around, Billy Mauff and Jay Muller handled the job in their Superboat-class WHM Motorsports Skater catamaran.